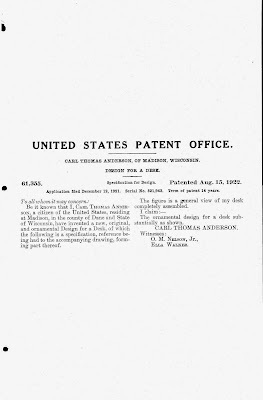 Carl Thomas Anderson is the cartoonist behind the comic strip, Henry. He had actually created other strips before then, including Raffles and Bunny and Herr Spiegelberger, the Amateur Cracksman. He freelanced for Judge, Life , and Puck. In 1935, he wrote How to Draw Cartoons Successfully which was republished repeatedly over the next decade. Throughout all of this, Henry was unquestionably his most successful cartoon, but it's clear that, despite not really taking up drawing until his 20s, he worked hard at it throughout his lifetime. But one of the things that often gets lost when discussing cartoonists from Richard Outcault to Charles Schulz to Stephan Pastis is their lives outside of cartooning. These people are all multi-faceted individuals, and pursue interests beyond what they're famous for. Even in David Michaelis' comprehensive biography Schulz and Peanuts, he continually resorts to tying the events in Schulz's life to what happened in the strip. So it's kind of interesting to come across items that aren't directly related a cartoonist's comic strip. In the case of Anderson, he actually holds a design patent in the U.S. for a desk he designed. He was actually a carpenter before becoming a cartoonist and used those skills in his 50s to craft a different design for a desk. 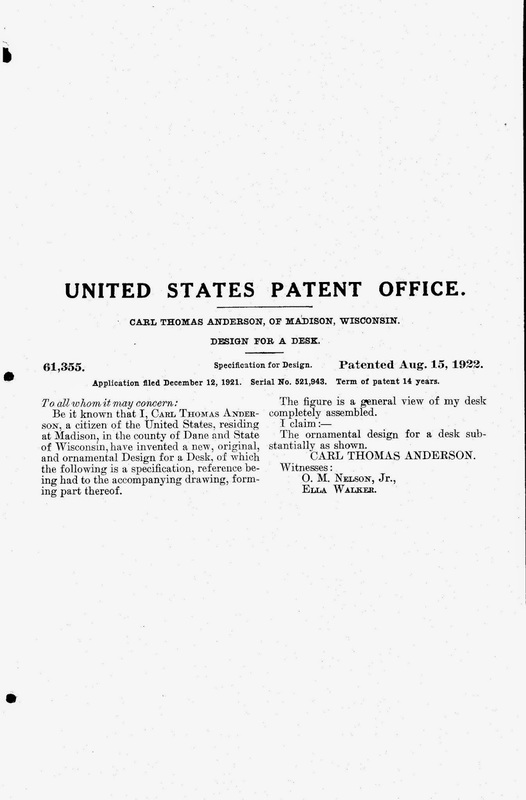 The patent filing isn't terribly elaborate in its description, but it includes a wondefully done illustration... It's essentially a more elaborate artist's horse and, although it doesn't appear to be written as such, I've read elsewhere where this version supposedly folds down. 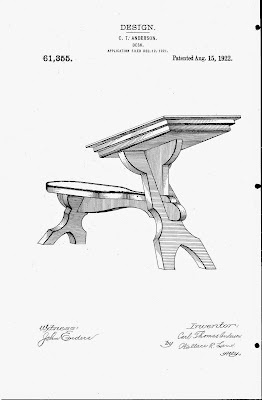 I've only found one other piece of art showcasing the desk (by Anderson) but it doesn't explain how this folding feature might work either. My best guess is that it doesn't "fold", so much as "come apart easily." I suspect the legs and the drawing surface itself aren't actually connected, but are held in place with friction and gravity. This would certainly require a bit more ingenuity and craftsmanship than simply screwing the pieces together, and points to Anderson's continued interest in carpentry decades after he supposedly would have given it up. Not a huge discovery, but a fascinating contextual one that puts a more colorful light on someone who might otherwise be thought of as just a cartoonist.